Oh, I’ve missed you! I’m so glad to write again and catch you up on the latest ministry news. 1. 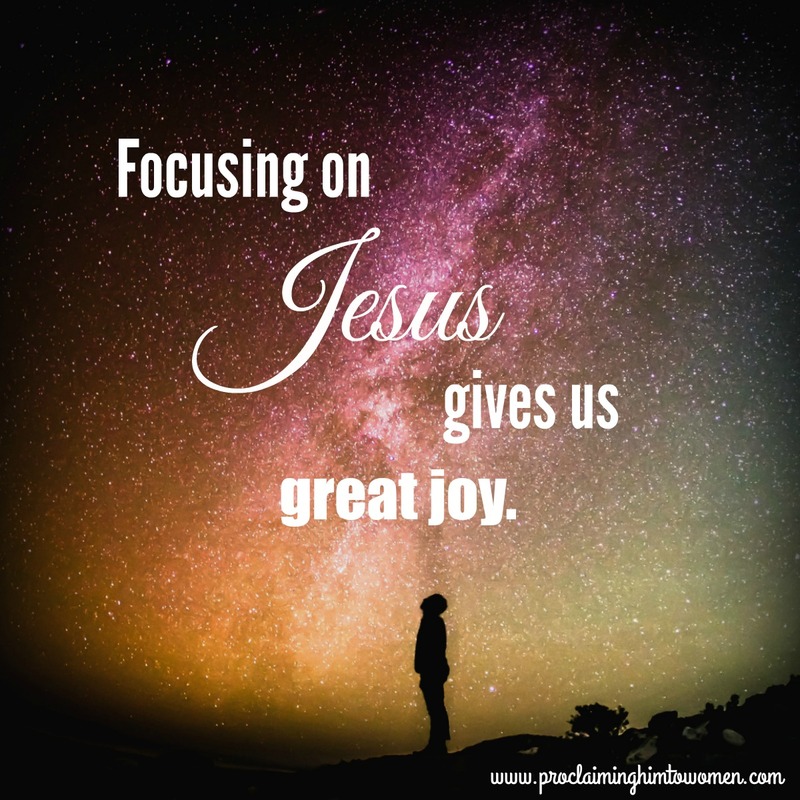 Focusing on Jesus gives us great joy. Amen! Such a simple truth yet one that packs such power. 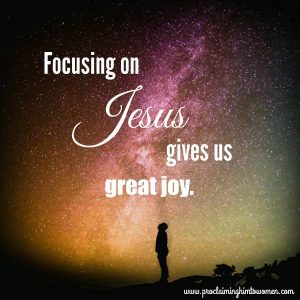 Focusing on ourselves is less-than-satisfying, yet when we intentionally turn our eyes onto Jesus—who He is and what He’s done—joy replaces distress. The angel who appeared to the shepherds told them not to be afraid because he brought “news of a great joy … for all the people; for today in the city of David there has been born for you a Savior, who is Christ the Lord” (Lk. 2:10, 11). We unpacked what it means for Jesus to be our Savior as well as who He is as Christ and Lord. It thrilled me to focus on Jesus and share His beauty. 2. Jesus was born for (insert your name). His birth brought glory to God and peace among men. I find God’s personal touch as we each insert our own name in the above sentence. Yes, my friend, Jesus was born for you. His birth brought glory to God as “the image of the invisible God” (Col. 1:15). And Christ glorified God throughout His life by demonstrating who God is. Jesus’ birth also brought peace among men. We first receive this peace when we trust Christ as our Savior, and then this peace is available on a daily basis as we turn to the Lord in every situation. What’s wild and crazy in your life? Ask the Lord to be your peace. What keeps you awake, tossing and turning in the night? Ask the Lord to be your peace. He cares about every aspect of your life—nothing and no one is insignificant to Him. 3. Truth about Christ should enthrall us, causing us to treasure, ponder, and share Him. The shepherds were overwhelmed with all they saw and experienced on the day of Jesus’ birth. They glorified and praised God, plus they told others the angel’s statement about Jesus our Savior, Christ the Lord. All who heard the shepherds’ words marveled. But Mary, Jesus’ young mother, “treasured up all these things, pondering them in her heart” (Lk. 2:19). We’re left with these people’s responses and a question: how will each of us respond to the enormity of what God’s done for us through Jesus’ birth? I pray we look for Him on every page of the Bible, thank Him for His willingness to come, and share Him through our words and actions. So, my friends, I extend this message with hope that God will speak into your life through it. He knows. He loves. He gave. His Son was born for you … to die for you. In other news, I’ve been posting devotional videos on Facebook in an ongoing effort to engage and grow my audience. Interestingly, I’ve found I enjoy utilizing video more than I anticipated. God is so good to use our offerings for His purposes. Please join me on my Facebook page if you haven’t already. Also, I e-mailed my book proposal to another agent on Nov. 30, and I praise the Lord for helping me reach this goal. I wonder what the result will be? God has opened the door to a very interesting opportunity this Friday, Dec. 16. I’m scheduled to speak at Christian Family Academy in Conover, NC to a group of mostly middle school boys (good thing I have three sons ). My topic deals with what it’s like to be a writer, and Lord willing, I’ll inspire some young minds to write for Christ. Oh! My mission trip! God has blessed me with over half of the funds. He’s always faithful. As I trust Him to provide the rest, I’m working on getting my passport—I plan to travel March 13-20, 2017. It’s getting closer and closer. Please feel free to share my fundraiser page, which includes a short video about ministry plans for Nicaragua. Thank you so much! One last item: I’m scheduled to teach on 1 Peter 3:1-6 at a local church on Jan. 21, 2017. 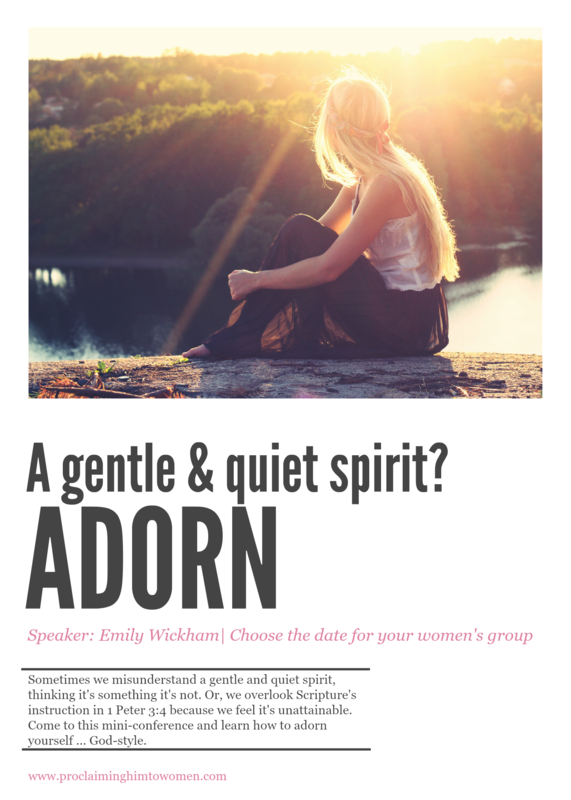 If you’d like to host the “Adorn” mini- conference at your church, please contact me. I’d be pleased to discuss details and hear how I can best serve you. Father, Thank You for the gift of Your beloved Son. We treasure this One who is our Savior, Christ the Lord. Please fill us with Your Spirit and inspire us with Your presence as we focus on Christ this Christmas season. In Jesus’ name, Amen.